We are so excited to present our first Block of the Week design! Yes it is a Quilter's Garden original! We have named it GOTCHA COVERED. It is approx. 30" x 36". Starting next week July 1, running for a total of 6 weeks, we are offering a little summer excitement. 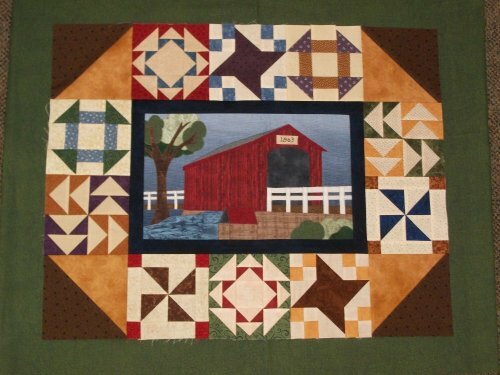 Week #1 is the applique block of the Covered Bridge. Weeks #2-6 will be kits for the pieced blocks--you will make 2 blocks of a design, but in different colors. The cost is only $4.99 per week for the 6 weeks and a finishing kit of $14.99 (the corner half square blocks, the green outer border and binding). We do ask that you pay for the finishing kit when you pick up the first kit, then we will have it ready with the Week #6 blocks. Can't get in every week? No problem, we can mail or hold 2-3 weeks of kits for you. Let us know! Call us at 815-879-3739, or e-mail us at quiltersgarden@yahoo.com to get signed up.